A number of color palettes are Dynamic palettes. 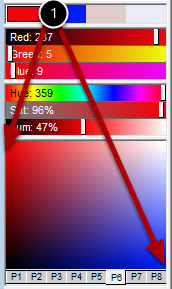 A dynamic color palette is automatically updated each time a color is selected. Shown here is the Dynamic - 2 Color palette. In this palette a smooth span of color is created automatically between colors 1 and 2 (from the color bar) each time those colors change. Notice that some palettes smooth the colors to allow for a much greater range of color gradients than the 256 colors normally available in a palette.